I know I said it yesterday, but October? Already? You know what that means! Hooking up with Farley for her October Currently. It's 6:00 here and my daughters are vegging out in front of the television watching Phineas and Ferb. My husband is hard at work in the kitchen doing the dishes. Gotta love a man who does the dishes and cooks! I am really excited that my Fall break begins this Friday at 3:00 pm. Yes, I am counting the days and minutes. Things have been piling up in many areas of my life and I really need to prioritize and get caught up over the break. It has been a long time since I have been surfing. The main reason is that there hasn't been any waves! On Saturday I went to the Sister's conference and got a text from my surf buddy telling me that there were finally waves, but she was attending the conference as well! So we were sulking a bit about missing the swell. Midway through the conference she texted me again. Well I thank the Sister's for making sure I was not in the water that morning!! Needless to say I wasn't very motivated to get in the water on Sunday! I am hoping for waves over the break with no signs of sharks! I will leave you with a special treat. 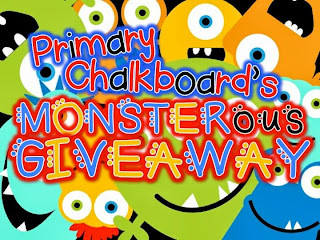 The Primary Chalkboard is having a Monsterous Giveaway! There are so many Ahh-Mazing items that you will not believe your eyes!! I honestly wish I could enter this fantastic giveaway because I really want this bag and bunting!! 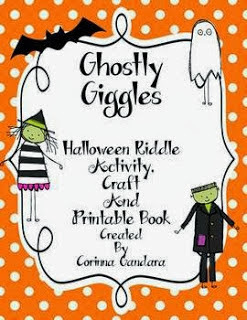 You can also win my Ghostly Giggles pack and tons of other fantastic teacher resources. Head on over to the Primary Chalkboard to enter to win!! LOVE that bunting and bag! It's so cute! How wonderful that you guys get a fall break! How long does it last? It's one week! Long enough to recoup and get ready for 2nd quarter! Hope you have a fantastic Fall break! With the rainy weather I'm seeing lately I can't even imagine being in the sun or surfing - you are so lucky! Enjoy your break! I loved teaching in Hawaii and so looked forward to that much-needed break! Waves are picking up here in San Clemente, so you should be getting that swell too! So glad you're part of "The Primary Classroom." If you ladies need a 1/2 blogger, I'd love to be part of it! 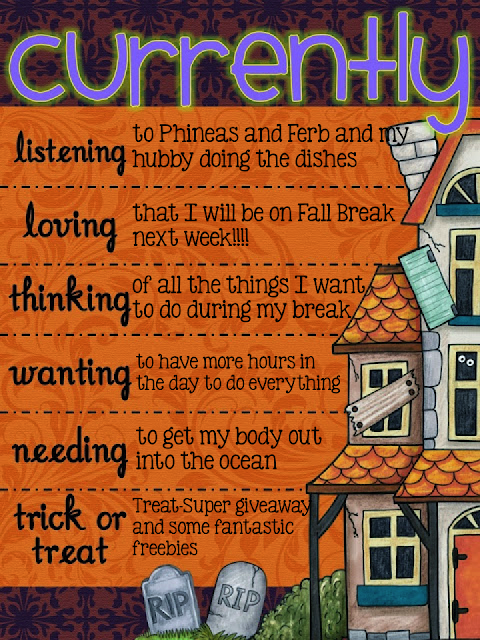 Enjoy your time off! Yay for breaks! I wish I could have one sometimes, but with my five kids I don't think I'll get one soon. If there were sharks in any water I don't know if I would ever go in. Thanks for stopping by my blog : ) Enjoy your break! Five For Friday-End of Conference Week!